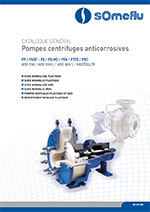 Horizontal centrifugal plastic close-coupled pumps are derived from the process pump range NP. There are designed to offer a cost effective solution to the process pump. Made of plastic such as PP, PE, SOMEDUR®, PVC, UHMW-PE or PVDF, parts are machined from massive block of plastic. Main advantages are the reduced size, an easily maintenance with a reliability and performances which fit to the most complex requirements. The ECO range is the perfect solution for an alternative cost effective solution to the NP range. This range is widely use in many industries. The ECO-N range is the perfect solution for an alternative cost effective solution to the NP range which can be installed in place of the process pump ISO 2858. The HMP-N/S offers a wide range of customized solutions for many applications in all industries.